Robert Dover’s professional and competitive accolades have left a legacy unmatched by any other American dressage rider. A dressage specialist since the age of 19, Robert’s dedication, creativity, and commitment to excellence have proven influential in raising the standard within the sport in the U.S.
Robert made his first Olympic appearance at the 1984 Los Angeles Summer Games at the age of 28. He went on to represent the United States at the next five consecutive Olympic Games, earning four bronze medals along the way. In addition, Robert rode on four World Equestrian Games teams. In 1987, he made history by becoming the first American to win the Aachen Grand Prix since 1960, defeating six-time German Olympic gold medalist Reiner Klimke in the process. After retiring from the competitive arena, Robert served as the technical advisor/chef d’Équipe for The Dutta Corp/U.S. Dressage Team from 2013 through the 2018 World Equestrian Games. Under his leadership, the team earned a gold medal at the 2015 Pan Am Games, a bronze at the 2016 Rio Olympic Games, and a silver at the 2018 World Equestrian Games. 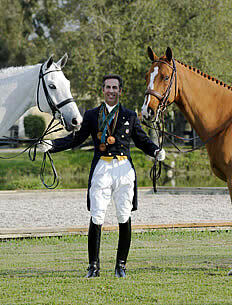 He has served on the U.S. Olympic committee Athlete Advisory Council and the U.S. Equestrian Team Dressage committee. Robert is well-regarded as a coach to both established and up-and-coming international pairs. He played a critical role in fundraising for the high-performance competition and training program and has taught in several growth and development programs, seeking to increase the depth and skill of riders aiming for the international ring. In 2007, Robert partnered with the Fox Reality Channel to create and promote a TV show called “The Search for America’s Next Equestrian Star: Dressage.” A field of 400 applicants was whittled down to just six who competed for the chance to become Robert’s second assistant trainer at his Romance Farm in Wellington, Florida, along with other prizes. He also is the creator, producer, and master of ceremonies for “American Equestrians Got Talent” that has raised hundreds of thousands of dollars for high-performance equestrian sport. But Robert’s impact on the equestrian community extends beyond just the dressage arena. In 1996, he founded the Equestrian Aid Foundation, an organization which financially assists equestrians suffering from life-threatening illness, catastrophic accident, or injury. He remains involved as the chairman emeritus. Through his new Robert Squared, a line of luxury vegan leather tack and equipment, he gives a portion of all the proceeds to Equestrian Aid Foundation, Brooke USA, and Danny & Ron’s Rescue. For his overall horsemanship and dedication to the sport, in 1994 Robert was named the U.S. Olympic Male Equestrian Athlete of the Year. He was inducted into the Roemer Foundation/U.S. Dressage Federation Hall of Fame in 2008. Lexington, Ky. – The United States Equestrian Federation (USEF) is pleased to announce that Robert Dover will act as Technical Advisor in addition to serving as Chef d’Equipe at agreed upon U.S. Dressage Team competitions. He will also continue to play a significant role in fundraising for U.S. Dressage programs. Dover assumed the U.S. Dressage Chef d’Equipe/Technical Advisor role in 2013. Under his leadership, the U.S. Dressage Team returned to the podium at the 2016 Rio Olympic Games, winning a Team Bronze medal. A six-time U.S. Olympian and four-time Olympic Bronze medalist, Dover has spearheaded the development of an effective pipeline program focused on maintaining U.S. Dressage’s standard of excellence across all levels. Alongside his Technical Advisor role, Robert will continue to lead the fundraising efforts with which he has been so successful over the last three years. The funds he has helped raise have contributed significantly to the growth and success of the programs. Dover will serve as the U.S. Dressage Technical Advisor for the next two years. Wellington, FL (January 22, 2016) – The first week of the 2016 Adequan Global Dressage Festival (AGDF) in Wellington, Florida played host to scores of professional and amateur dressage riders. This energetic and competitive environment was the perfect place for the inaugural presentation of Carol Cohen’s Global Dressage Visionary Award, which was presented to Team USA chef d’equipe, Robert Dover. Carol Cohen, a Wellington, Florida dressage visionary and founding member of the Adequan Global Dressage Festival, was pleased to name Dover as the first recipient of the prestigious award. Cohen will be presenting the Global Dressage Visionary Award during all CDI weeks of the world-renowned dressage festival throughout the rest of the season. Dover, a six-time Olympic athlete and the current chef d’equipe of the U.S. Dressage Team, has been involved with the Adequan Global Dressage Festival since its inception. “I thought there was an opportunity that was being missed here,” Dover said, recalling his thoughts from before this international show circuit existed. He realized that an unused polo field in the South Florida horse community would be a perfect venue to renew interest in the sport of dressage in the community – where the hunter, jumper, and polo disciples had already caught the world’s attention. Dover’s road to the head of the American dressage team all began when his former Olympic coach, Colonel Bengt Ljungquist, urged Dover to carry forward what he had been taught. “I had no idea what he meant by that,” Dover said. “I was 18 years old. It wasn’t until much later in my life that I reflected back on it and realized that he was saying I was going to have some role in the sport bigger than I even knew.” Now, Dover is coaching and training hopefuls for Team USA, which is planning to go for the gold at the 2016 Olympic Games in Rio de Janeiro, Brazil. Cohen has also been instrumental in creating the first Adequan Global Dressage Festival Leadline class, which will begin on January 29 as a kick-off to the FEI Grand Prix Freestyle competition. She is sponsoring the class in an effort to bring new dressage riders into the discipline. “Our community needs to foster the future riders of the sport, and my hope is that the leadline class becomes a recognized division in the future,” she said. 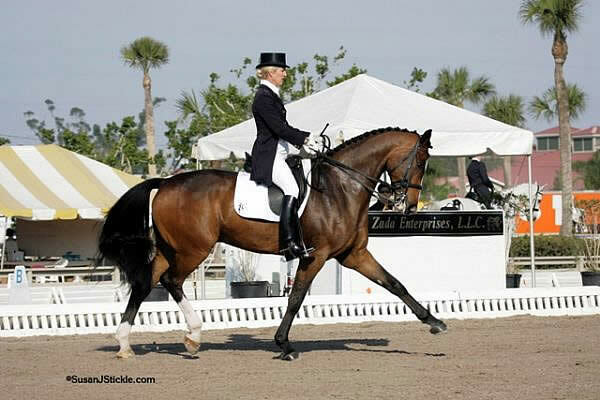 Not only is Cohen a passionate advocate for the sport of dressage, she is also active in the local Wellington, Florida community as a licensed Real Estate Agent under the umbrella of Engel & Völkers real estate brokers. Like the Adequan Global Dressage Festival, Engel & Völkers’ presence is substantial in the Wellington area as well as throughout the world. For more information about Carol Cohen and her listings at Engel & Völkers Real Estate in Wellington, please visit carolcohen.evusa.com. To see Carol Cohen award Robert Dover in the Global Dressage Visionary Award presentation video, go to https://www.youtube.com/watch?v=Ja4P34Y3uG4&feature=youtu.be. Lindsey Brewin and Vaillant in the Youth Section with Robert Dover. Photo By: Carrie Wirth. Gladstone, NJ – October 14, 2014 – The United States Equestrian Federation (USEF) and the United States Equestrian Team (USET) Foundation held the second Dressage Pipeline Clinic, one of a series of events aimed at pairing the country’s top dressage educators with talented future prospects for international competition. USEF Chef d’Equipe/Technical Advisor, Robert Dover, USEF Developing Coach, Debbie McDonald, and USEF Developing Horse Coach, Scott Hassler, came together at Linda and Michael Fowler’s Epona Farm in Thousand Oaks, California, on Oct. 11-12 to help showcase, develop and mentor top horses and athletes. The clinic was made possible by USET Foundation trustee Betsy Juliano and Havensafe Farm. The participating athletes received individual lessons on their horses and took part in educational sessions focused on fitness and sports psychology as well as how to manage relations with owners, sponsors and the media. Ashlyn De Groot, from DG Bar Ranch in Hanford, California, was selected for the clinic and brought her 6-year-old mare, Dalina DG, a Dutch Warmblood mare by Jazz. Carly Taylor-Smith from Malibu, California and her 4-year-old Rosalut NHF, a dark bay Oldenburg gelding by Rosenthal, were also selected. Taylor-Smith rode “Ludo” to championship honors in the Four-Year-Old division at the USEF/Markel Young Horse Championships. On Saturday evening a reception and dinner included a presentation on working with the media, given by Mason Phelps Jr. and Carrie Wirth of Phelps Media Group, as well as a presentation by Juliano. Juliano shared the unique opportunity for the sport of dressage in the U.S. and stressed the importance of the team concept and applying the use of strategy by working with USEF and the USET Foundation for forward progress. Wellington, FL (April 3, 2014) – Few people understand better what goes into dressage at its highest levels better than Heidi Zorn, president of Premier Equestrian (the Official Dressage Arena supplier for the USEF), and Robert Dover, four-time Olympic Bronze medalist (six-time consecutive U.S. Olympian) and now US Dressage Chef d’Equipe/Technical Advisor. So when Zorn warmly presented Dover with the Premier Equestrian Sportsmanship Award, not only for Week 12 of the Adequan Global Dressage Festival at the Palm Beach International Equestrian Center in Wellington, FL, but, as she joked, for being “Sportsman of the Season,” it was as inspired a pairing as peanut butter with chocolate. “Thank you; you’re so very kind,” Dover said with the same enthusiasm for his sport that has been his trademark since 1987, when he piaffed and passaged into U.S. and world history by defeating six-time German Olympic Gold medalist Dr. Reiner Klimke in front of a 65,000-seat house to win the Aachen Grand Prix. Today, it’s Dover who can be credited with bringing an Aachen-level of enthusiasm to American dressage, and nowhere has that been more evident than at Wellington. “Our philosophy of always providing ‘premier’ products at the best possible price to the consumer is in line with the growing number of dressage enthusiasts who want to minimize expenses without giving up quality or jeopardizing their horses’ safety and well-being,” Zorn added. Premier Equestrian is the Official Gold Sponsor of the NAJYRC and is the official dressage arena of the USEF and Adequan FEI NAJYRC, July 15-30, 2014 in Lexington, KY. Considered America’s leading manufacturer and distributor of dressage arenas, Premier Equestrian’s website offers extensive and informative information designed to help horse owners understand the differences in arenas as well as footing. Premier Equestrian offers a complete line of horse jumps and horse jumping equipment, including standards, sponsor jumps, and cavaletti. Premier products include barn accessories, books & DVDs, arena grooming and maintenance equipment. For a free catalog, free arena footing sample or free arena sand analysis, call (800) 611-6109 or visit www.PremierEquestrian.com. Lexington, Ky. – The first USEF Dressage Observation & Strategic Planning Session of 2014 took place earlier this week at Havensafe Farm South in Wellington, Fla. Lead by Robert Dover, USEF Chef d’Equipe/Technical Advisor, the session provided training and strategic guidance for athletes as they look toward international competition and the 2014 Alltech FEI World Equestrian Games. The session featured 18 athlete/horse combinations over three days. Dover was able to work individually with each athlete/horse combination, striving to enhance training practices and assist athletes in achieving their competition goals. Athletes’ personal trainers/coaches were also invited and participated in the sessions. For more information about the High Performance Dressage Observation and Strategic Planning Sessions, visit: http://usef.org/documents/highPerformance/dressage/USEFDressageTrainingSessions2013_2014.pdf. Questions should be addressed to Jenny Van Wieren-Page, Managing Director of Dressage, by phoning (859) 225-6949 or via email to jvanwieren@usef.org. Photos courtesy of Robert Dover at DoversWorld.com. Lexington, Kentucky – April 19, 2013 – The United States Para-Equestrian Association would like to congratulate Robert Dover on his appointment as the next Chef d’Equipe/Technical Advisor for the U.S. Dressage Team. Robert Dover’s appointment is currently pending successful negotiation of a contract with John Long, USEF CEO and James Wolf, USEF Executive Director of Sport Programs according to the USEF website. Lexington, KY – The United States Federation’s Executive Committee has approved the recommendation of Robert Dover as the next Chef d’Equipe/Technical Advisor for the U.S. Dressage Team pending the successful negotiation of a contract with John Long, USEF CEO and James Wolf, USEF Executive Director of Sport Programs. For more information regarding the process of hiring the Technical Advisor/Chef d’Equipe for the U.S. Dressage Team, contact Jenny Van Wieren-Page at (859) 225-6949 or by email JVanWieren@usef.org. WELLINGTON, FL – February 15, 2013 — The Gay Polo League will honor gay Olympians during the April 12-13 International Gay Polo Tournament festivities. Six-time Olympian Robert Dover will serve as Chairman of the Gay Polo Olympian Committee. Dover has earned more honors than any other U.S. dressage rider in the sport’s history. He competed in six consecutive Olympics for the U.S. equestrian team, four world championships and seven World Cups. Mason Phelps, Jr., founder and president of Phelps Media Group International, will serve as committee vice chairman. Phelps, a lifelong horseman, was a U.S. Olympic alternate for the U.S. three-day team that competed in the 1968 Mexico City Olympic Games. South Florida has long been a home for of U.S. and international gay Olympians in all sports including beach volleyball, equestrian, soccer, swimming, diving, tennis and track and field. The committee will reach out to several gay Olympians, including four-time Olympic diving gold medalist Greg Louganis and 2004 Athens Olympics tennis player Martina Navratilova, to be a part of the fourth annual International Gay Polo Tournament that attracts some of the world’s top gay players at Grand Champions Polo Club in Wellington. All gay Olympians will be guests at the Friday, April 12th Jewels and Jeans Kick-Off Party, sponsored by the Rotary Club of Wellington at the International Polo Club Grande Pavilion at 6:30 p.m.
On Saturday, they will be treated to the consolation and championship polo games at Grand Champions Polo Club at a VIP table for lunch and beverages followed by a Victory Party field side in the Elite Tent. Those gay Olympians interested can contact Phelps Media Group, Inc., International at 561-753-3389 or email gpl@phelpsmediagroup.com. About the Gay Polo League: GPL is a community that shares a love for adventure, fun, and challenging sport of polo. GPL is committed to providing members with an enjoyable, supportive and competitive experience. GPL represents a wide range of ages, backgrounds and skill levels. GPL trains and competes in mainstream matches and events while sharing enthusiasm for the sport, to change perceptions about the gay community. For more information about GPL, visit www.gaypolo.com.